Neil is seen as a friendly and approachable instructor who can teach to students at all levels. With an impressive 44 years of martial arts experience, Neil has produced some great martial artists over his time. Some students have taken things to the next level by performing in public displays, winning competitions in Hong Kong, Europe and the UK and appearing on television as stunt doubles. Neil constantly motivates his students to fulfil their potential and his humour creates a positive atmosphere during training sessions, which makes every student come back for more. Head Instructor Neil Genge has trained in Shaolin Gong Fu at the Wushu Guan and Shaolin Temple since 1989. 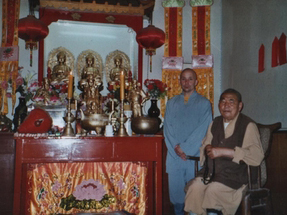 Neil had the honour to take discipleship with the venerable Grand Master Shi Suxi (the first Englishman to do so). 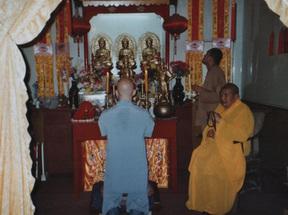 His ceremony was conducted behind closed doors at the temple. He was given the buddhist name Shi De Yan. Laoshi Genge has been studying martial arts since 1974. In 1994 Laoshi Genge was given permission by Master Lun Kai, (an original student of Grandmaster Yip Man), to teach Wing Chun. Laoshi Genge now fully devotes his time to teaching and promoting Traditional Gong Fu.